Pam Stewart showing the young horsemen/women samples of invasive plant species found in the Park. In spite of the heat, the intrepid kids and grand kids of the Buffalo River Back Country Horsemen had their third annual weekend of learning and practicing Leave No Trace skills, invasive plant identification, proper trail work and tool usage, and Dutch oven cooking, All this while improving horsemanship and swimming techniques. Thirteen young cowgirls and cowboys came with seventeen parents, grandparents, aunts and uncles to horse camp on the Buffalo. On Friday morning. 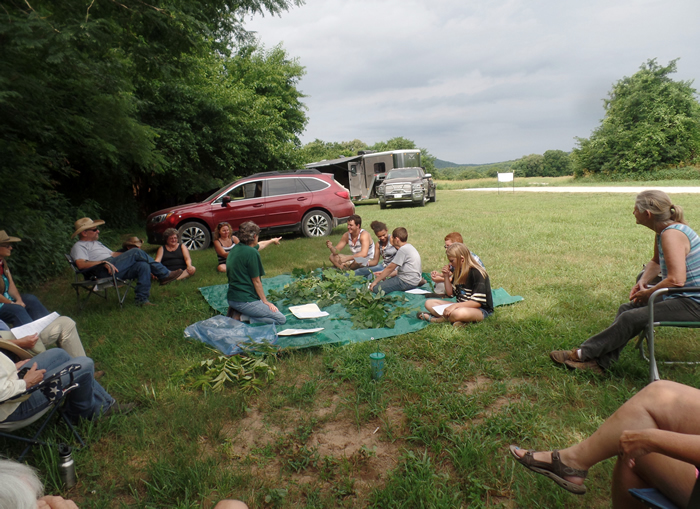 plant specialist Pam Stewart taught the young people different invasive plants found in the Buffalo National River Park; then everyone (kids, parents, and grandparents) mounted up to ride out and identify some of those specimens. As soon as the ride was over, the River couldn’t have been more inviting, as the temps were extreme! Later, Jacque Alexander reviewed Leave No Trace rules and gave each participant a litter bag of goodies useful in many circumstances on the river, on a horse, or in the campground. Gathering around the campfire may not have been what one wanted to do in the heat, but when a supper of kabobs (prepared by organizer Marjorie Heacock) with all the trimmings was presented, the line formed quickly to make-your-own kabob and set it over the fire for cooking. Torye and Tennille helping young contestants Evan and Owen. After Saturday morning’s cowboy breakfast (cooked up by organizer Bill Kenter), everyone saddled up for a trail ride which took them to Skull Bluff, a rather “famous” place on the River. The young riders used their Leave No Trace knowledge to pick up litter along the trail and were later rewarded for the most trash collected. The ride was once again followed by time in the river before the Games (arranged, planned, and carried out under the direction of Marjorie Heacock) began. Most events were on horseback with each participant competing for prizes. Events included the egg-in-a-spoon carry, the 2-person 2-horse- 1-piece-of-toilet-paper carry, the giant pant race, the horse-race-apple-bob, water balloon toss, and too many more to mention. Great fun was had by participants and cheering crowds, as well. The last lesson of the day was given by Bobby Alexander who taught the up-and-coming cowboy cooks a few pointers in Dutch oven cooking. They prepared and cooked four different dishes–all delicious, all consumed by hungry campers along with the pot luck dishes provided by the other weekenders. It was time for the last ride on Sunday morning, so after another of Bill Kenter’s wonderful breakfasts, everyone was horseback again, and later again, the river was a cool and welcomed ending to the ride. Packing up and leaving good friends and riding buddies is the hardest part of such a fun and rewarding weekend. The Back Country Horsemen of America are dedicated to keeping trails open for stock use, and the Buffalo River BCHA works to help the Park in that and other trail maintenance efforts.